Last April, Andrew Feinberg and Francine Stephens moved their preeminent New Brooklyn Cuisine pizzeria Franny’s a few blocks down Flatbush Avenue to a space twice its size. This, of course, did nothing to alleviate the no-reservations wait. But that could change with the opening next month of Marco’s, the couple’s take on a classic trattoria, in the original Franny’s space. After all, if anything can dissuade fervent Franny’s fans from charging its vestibule like wildebeest during the dry season, it would be a new Feinberg-and-Stephens dining option. Not that the restaurants will be the same. The thing to know about Marco’s, according to its fact sheet, is that it is not Franny’s, which seems like a comment directed at nostalgists still shocked by the original’s closing and maintaining delusions of its return. The redesigned dining room has a clubby new look: lots of mahogany, cushioned banquettes, Paul McCobb chairs, antique silverware, leather-­bound menus, and a dashing new marble bar. About all that remains from Franny’s 1.0, in fact, is a brick wall and an old pew procured from a Crown Heights synagogue. The kitchen has gotten a heavy-duty makeover too. Executive chef Danny Amend, a seven-year Franny’s vet and Per Se alum, has banished the beloved pizza oven to make room for some swanky new equipment. So forget about clam pies and imagine spit-roasted pork loin with anchovy from the J&R; rotisserie, lamb chops with vinegar peppers from the wood-fired grill, and scallops seared on the plancha. (Amend is especially jazzed about the Zojirushi rice cooker, which he’ll also use for farro and other grains.) Marco’s menu is classically organized into antipasti, primi, secondi, and contorni sections, allowing for multiregional morsels like gnocchi fritti; rigatoni alla Norma; Venetian-style black squid; and, say, Italian rice with eel and saffron to come together on one table. The booze is local and small-batch, the cocktails a mix of prosecco-based aperitivi and boozy “old-man” drinks, and the wine all Italian with an emphasis on Tuscany. 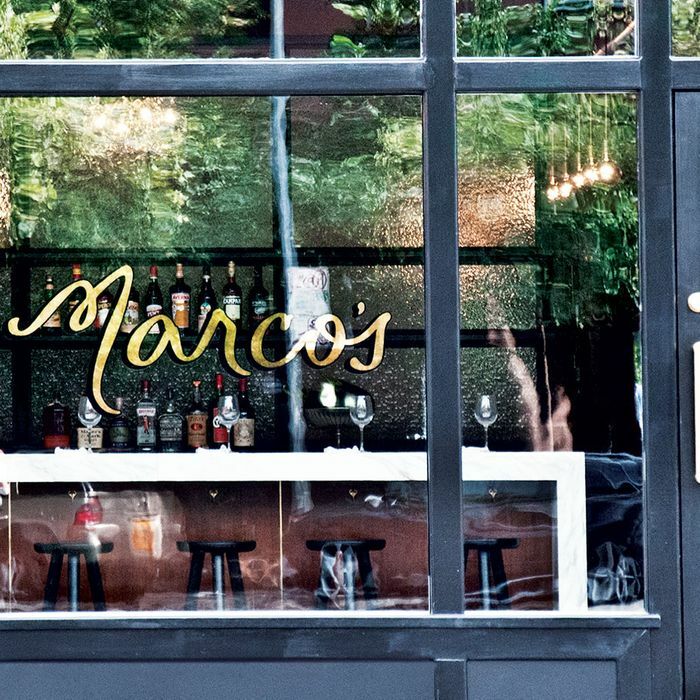 It pretty much sounds like everything you could ask for in a New Brooklyn trattoria, except, of course, reservations: Unless you’re dining with a six-to-eight-person entourage, Marco’s, like Franny’s, doesn’t take them. Marco’s, 295 Flatbush Ave., nr. Prospect Pl., Prospect Heights; 718-230-0427; September. *This article originally appeared in the September 2, 2013 issue of New York Magazine.